Paranthas are a quintessential breakfast in north India, especially Punjab and Delhi. Being a Punjabi, I have a fondness for paranthas, though I try to make low-calorie paranthas, using least amount of oil, instead of clarified butter. Anyway, I add oats and ragi flour to wheat flour to knead my daily dough for rotis and paranthas. This time I added finely chopped carrot, capsicum, peas, ginger and sprouts to the dough and made mix veg paranthas. 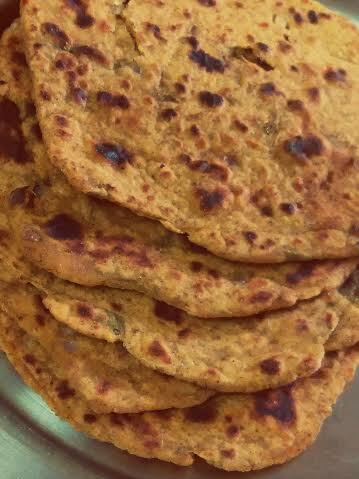 These Indian flat bread rotis are healthier form of paranthas and taste great. I enjoyed these with sweet amla chutney. Mix everything and make a semi-soft dough. Roll out into chapatis or paranthas. Fry using little oil/ghee on either side or both sides. I usually apply oil only on one side. Enjoy with pickle or curd or even ginger tea.